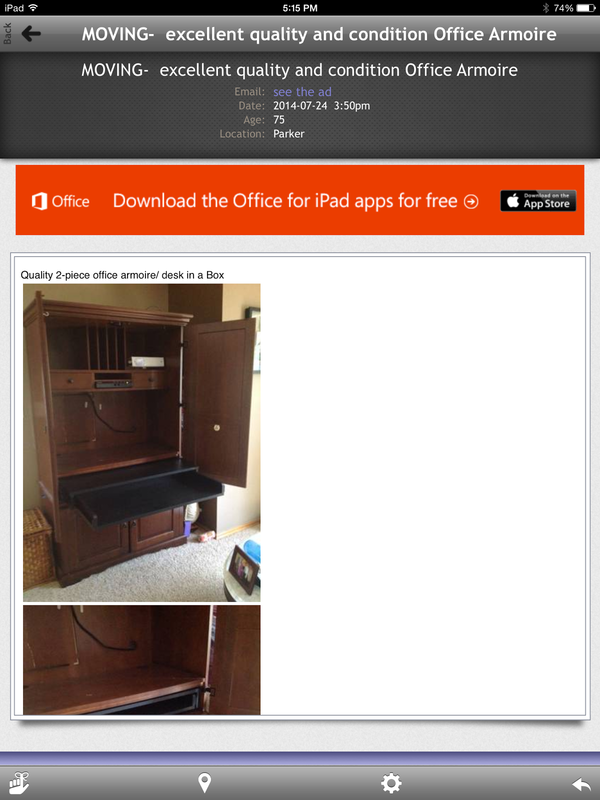 mimiberry creations: Free Armoire turned into $300. SO Easy & Fun! Free Armoire turned into $300. SO Easy & Fun! Notice that it was for sale for $75? Other key things to note: 1. They are moving, 2. Picture isn't staged that well with blankets shoved on the side of it, 3. 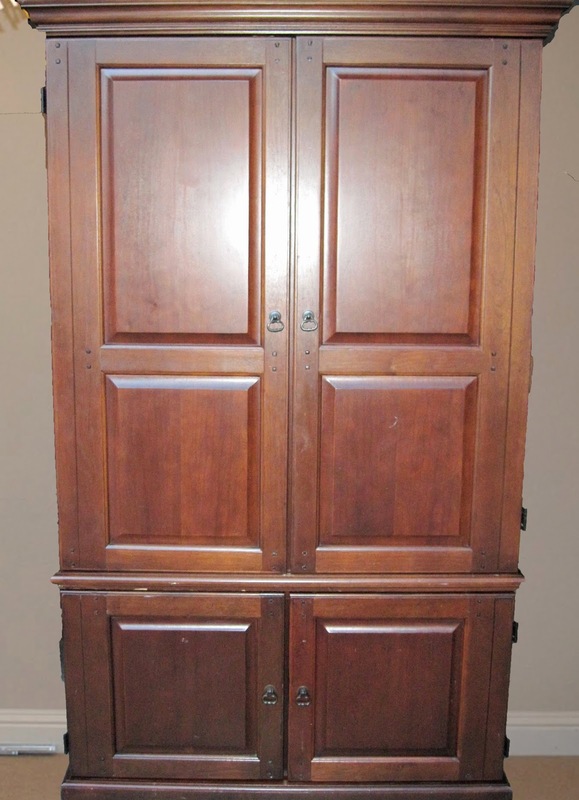 Fairly low price for an armoire (although you can often find them for free, or lower) 4. 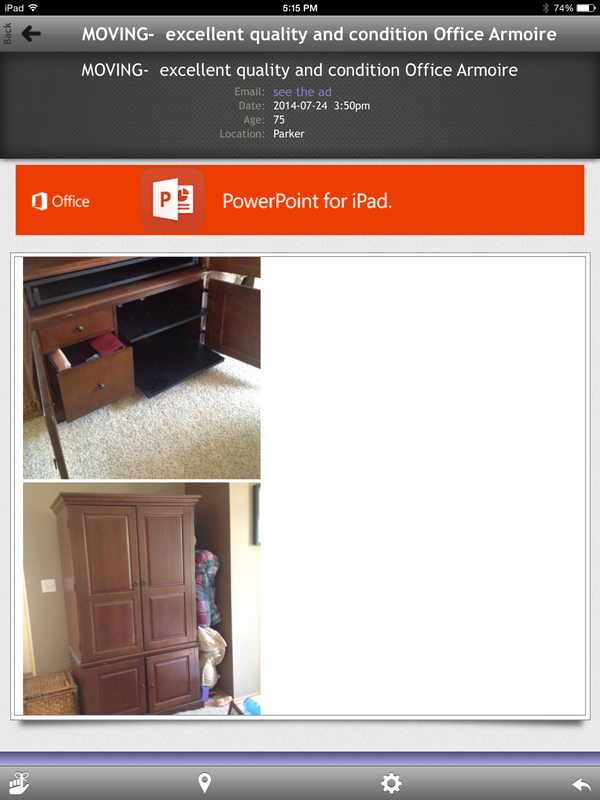 Lastly, it is an "office" armoire, or a computer station, the kind I wanted, and it looks like it is in good shape. 1. Months ago I saw the armoire(pictured below) on Pinterest (visit the how-to here) and I loved how it had everything you could possibly need for doing homework, bills, etc. and everything was in a fun, contained, easily closed off space. I made a mental note that I wanted to do something like this in the future. 3. I found the above ad for $75 and saw that she was moving and she was in the same town we were in. I went out on a limb and emailed her mentioning that I hope she could sell it for what she was asking for, but in case she couldn't and wanted it gone, that I would LOVE to have it for free and would come and take it off of her hands. It was a long shot but I had nothing to lose. I was super polite though and didn't want to insult her armoire in the least asking for it for free. I was WAY surprised when she called me an hour later and said it was on her sidewalk and I could have it. She had moved the day before and had her movers move it out with her. She said that I could go and take the "For Sale" sign off of it and take it away. Score! I thanked her profusely for her generosity. 4.The biggest pain of armoires is that they are extremely cumbersome. This project has been one of my easiest turnarounds, with the least amount of time and money spent, but it has taken longer to get it out of the door because it was too heavy for me and my husband to put the top (big) piece on top of the bottom piece to stage it, and thus it sat finished in our garage for weeks...mocking me...driving me crazy...making me question whether getting it was such a good idea....wondering if it would ever get out of our garage. 5. So I loved the Pinterest one shown above and questioned whether I should paint it white, or some other color, and add all of the bells and whistles as had been done. Considering the time, effort, and money, and realizing that it probably wouldn't add too much in my profit, I decided to go simple. Plus with all of my projects, I want to do a job well enough and to my liking that if I can't sell it for a price I am comfortable with, that I would be more than happy keeping it. Since the wood was in good shape and was a color that was still "in" I kept it as is. 6. 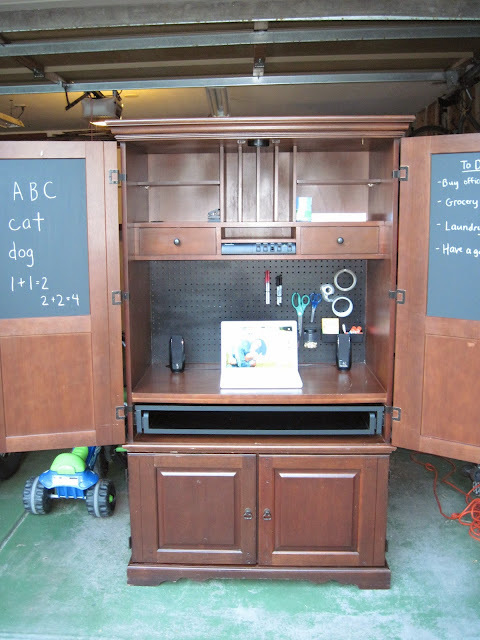 So I painted the two interior doors with chalkboard paint, (already had some but it is about $10 for a can or you can make your own,) so that the owner could write notes, lists, homework problems, etc., as well as I cut out the back (which already had a partial hole for the old computer monitor that was probably in it at one point), with my jigsaw, and replaced it with peg board that I spray painted black. 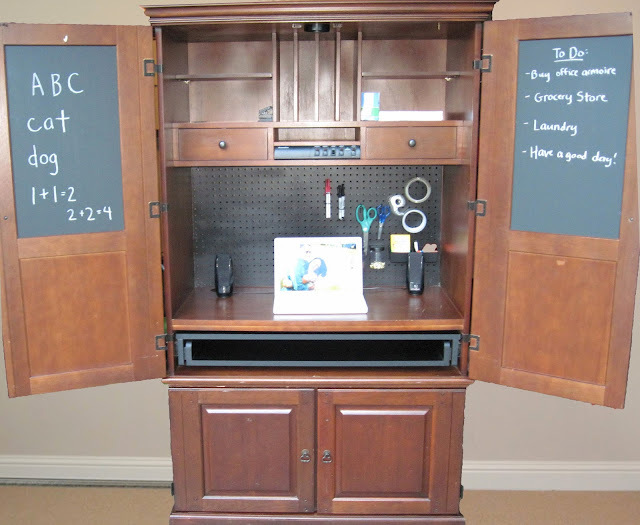 I bought a peg board kit at Home Depot for $11, spray painted the jar lids and the few hooks I put in the unit to match the black board, and then cleaned it all up. I bought the smaller peg board, which I think was around $8, I already had the spray paint, and so peg board + peg kit = $20 out of pocket. Did it make a difference? I think so. 8. I posted the pictures on Craigslist Sunday night with the price at $350 to hopefully catch some weekend lookers. The price was on the higher end, but still lower than several, and for the condition it was in and what it had to offer I felt this was a reasonable amount. Plus I really wanted to keep it for my family, but Nathan didn't want to have to eventually move it when we moved, so I priced it high somewhat hoping no one would buy it ;). Plus, with posting it so late on a Sunday night I figured I would probably have it for another week since early weekdays don't tend to have the same success as later weekdays and the weekend. To my surprise though I got two emails that night asking about it. One was kinda fishy sounding so I didn't go with that one, and the other was curious about dimensions (which I had been too lazy to get the night I posted it so I hadn't included them on the post). I emailed her back and didn't hear from her for a day making me think she was no longer interested. The next day she emailed me asking if I would take $300, which I was totally okay with, but told her I'd only take $300 if she could get it that day. Both of us felt we were getting a bargain and she came that night. 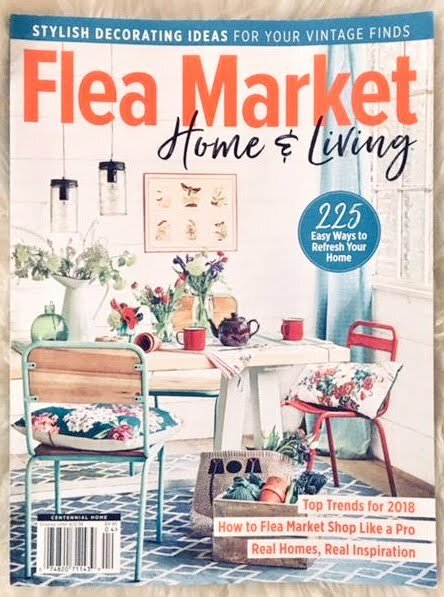 She was a super fun girl who wanted it for her sewing machine and crafts, and I was happy someone would love it as much as I would have. So there you have it, a $280 profit with very little effort (other than heavy lifting and deciding what I was going to do with it). 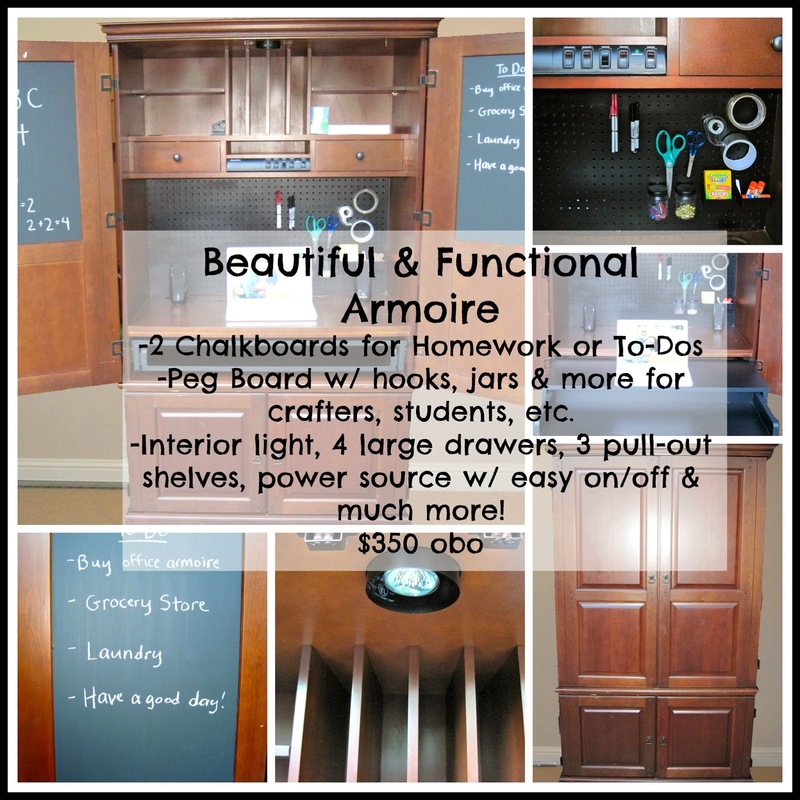 If you have an armoire and don't know what to do with it these are some ideas I have seen on Pinterest: turn it into a bookshelf, a toy storage area with cubbies, chalkboards, and more, or turn it into a pantry, a mud room with bench and shoe storage...it all depends on the layout of your armoire. I love Pinterest and the ability to search specific things and see the many creative transformations. 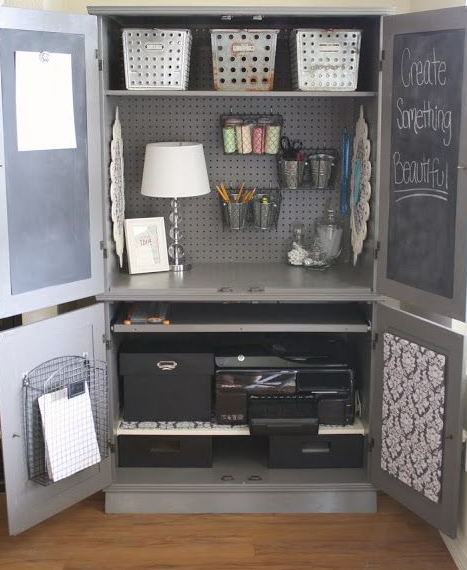 If you don't have an armoire and are feeling creative and want a simple project, start watching the free listings or furniture listings and don't be afraid to ask for it cheaper. Good luck and have fun! What have you done with an armoire? Or do you redo furniture for the fun of it or as a side business? I'd love to hear from you!